Approved for 3 College Credits towards a degree! This online 9 module hybrid certification is like no other in the fitness industry. This self paced mentored course will help you to develop skills for leading any group in an exciting safe routine. 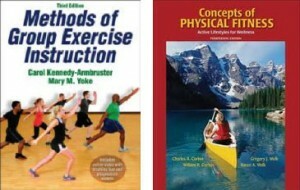 Lectures will cover the essentials of group exercise history, music, choreography, safety techniques, as well as basic applied science specifically relating to group strength, cardiovascular, muscular, and flexibility. Practical labs will expand into skill development for functional training, sports conditioning, circuit, boot camp, dance, step, kickboxing and equipment-based class techniques. A mind body class overview in Yoga & Pilates will cap it off so you can incorporate this knowledge into sections of your classes. A valid CPR/AED card must be presented to test. The test vouchers ($350 value) are included with this program. Get the entire online review program for the Group Fitness Instructor Certified course all in one place. Veteran subject matter experts / instructors to mentor you. Includes quizzes to assure your knowledge is solid. Engage your fellow international community of students worldwide. W.I.T.S. combined special video enhanced core knowledge online lectures with the optional extra’s of “LIVE “hands on practical skills”. Complete your goals at home or anywhere! !